Midsummer Light by Artecnica (ARTMIDSUM) at Pure Design / Bedroom / Lighting ::: Furniture for the Home, Office, Home Office, and More at Pure Design Online! The Midsummer Light has fast become a "modern classic!" This beautiful design looks delicate with its floral motif, but made from a Tyvek-like material, it's anything but sensitive! 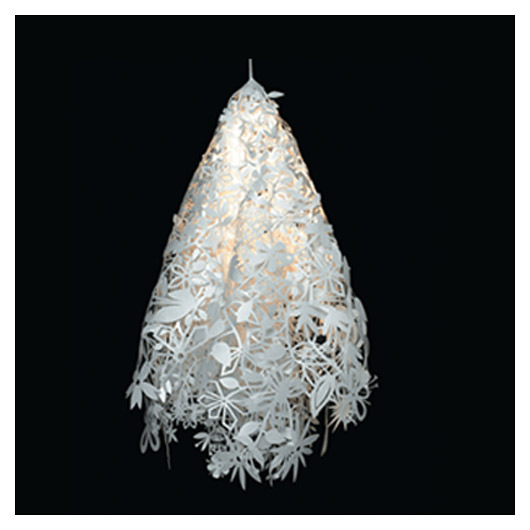 Assemble the base cone around a basic light bulb and unfold two layers of bright white flowers and leaves, securing them with hide-able stickers. Drape it as you like and get ready to shine! box is 26.5" L x 18.5" W. Dimensions of light itself are approximately 24" long.